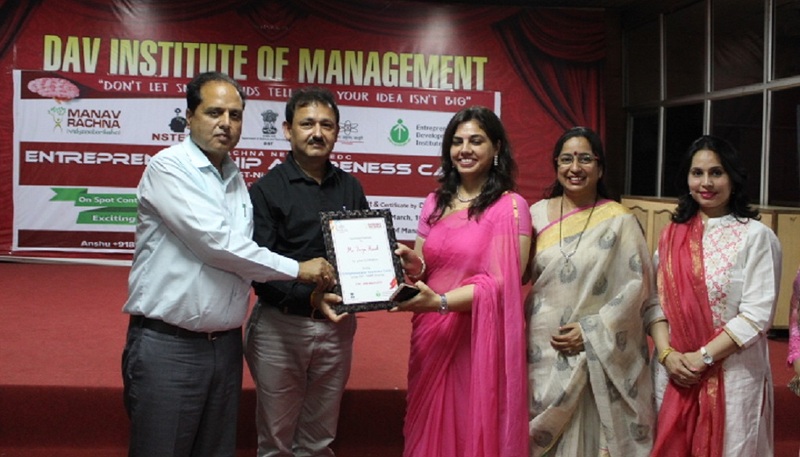 The New-GEN IEDC Manav Rachna (Innovation and Incubation Centre) under the aegis of Manav Rachna International Institute of Research and Studies organized the fourth Entrepreneurship Awareness Camp at DAV Institute of Management, NIT-Faridabad from the March 27 to March 29, 2019. The 1st programme was at MRIIRS (September, 2018), 2nd at MRU (October, 2018) and 3rd at GPW, Faridabad (February, 2019). All the four camps were sponsored by EDII AHMEDABAD under the DST-NIMAT SCHEME. 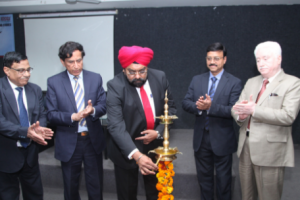 The camp was inaugurated by Dr. Sanjeev Sharma, Principal, DAVIM Faridabad. During his lecture, he presented the stats for entrepreneurial growth rate within the Indian Economy. Adv. Sonali Shah (Director Women Entrepreneurship Association) enlightened the students by sharing her own journey as an entrepreneur and motivating all the young men & women to do something of their own. Dr. Monika Goel presented the historical background of the Entrepreneurial process and how it is different with the present day. Dr. Anil Sarin discussed on the Identification of opportunities for the present day entrepreneurs. Day one closed with the enlightening session by Dr. Y.K. Awasthi who shared the importance of product selection and R&D related issues. 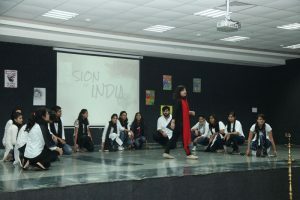 Day two began with a vibrant and energetic session by Mr. Karan Narula on SSI unit. Prof. D.K. Dudeja explained the Technical aspects of SSI units. In post lunch sessions, Col. Sachin Marwah, Dr. Rajender Kumar and Prof. I.K. Kilam discussed the finance related issues including introduction to the various funding agencies, preparation of DPR, and various legal issues. Day 3 began with an interesting session by Dr. Ritu Arora on creativity and innovation. 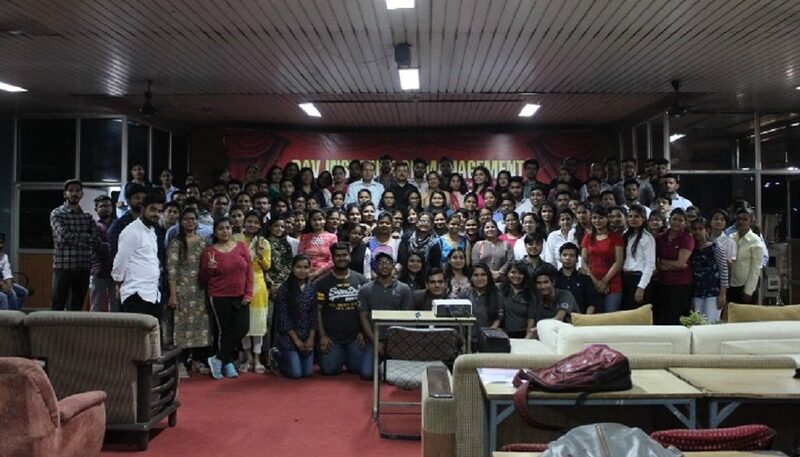 Mr. Nitesh Shankar discussed the importance of effective communication for an Entrepreneur. 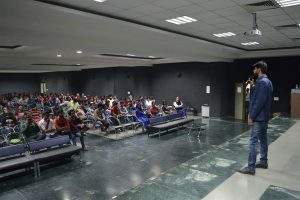 In the closing session, Dr. Pradeep Varshney and Dr. Sanjeev Sharma interacted with the students and took their feedback on the successful completion of the camp. Finally, the participants were taken to M/s Techno Udyog, IMT Faridabad, for the exposure of Industrial unit and their operations. During these three days, students of MRIIRS conducted few ice breakers/activities and the winners were felicitated by the EAC Team.